Tim Gleeson (left), Kevin Gorman, Helen Torley, Mark Gleiberman and Pieter van Rooyen. 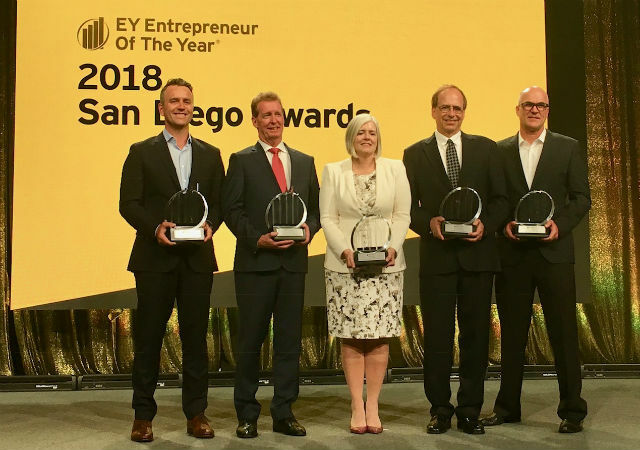 The global accounting firm EY has announced the five local recipients of its prestigious, international Entrepreneur Of The Year business awards. In addition, a special award was presented to Rory Moore to recognize his contributions to the San Diego startup community at EvoNexus. EY has recognized more than 10,000 business leaders around the world since the inception of the program 32 years ago. Among the past recipients are Howard Schultz of Starbucks, John Mackey of Whole Foods, Pierre Omidyar of eBay, and Irwin Jacobs of Qualcomm. The awards were presented at a gala in Del Mar earlier this month.